TradeNet Distributor Self Promo 3.5x8.5 Round-Corner Magnet - 25 mil. TradeNet says "Thanks, Distributors!" by giving away self-promo 3.5X8.5 Magnets, our most popular magnet size! * TradeNet helps Distributors generate business. TradeNet's only request is you have your contact information on the item so when your customers need to order more... they order from you! NOTICE: November and December deliveries of this free self-promo item possibly delayed due to seasonal demand. 250 FREE 3.5X8.5 Magnets. Round corners. Brilliant full-color process. FREE shipping! JUST as TradeNet is giving back, you can too with this self-promo. Consider including the logo of a not-for-profit organization of fund-raising event along with your logo. * Limit two free, self-promo orders per company representative. Logos from a different business or for-profit organization are prohibited. Logos of non-profit organizations may be included, i.e. a self-promotional product for distribution at a fundraiser or charitable event. 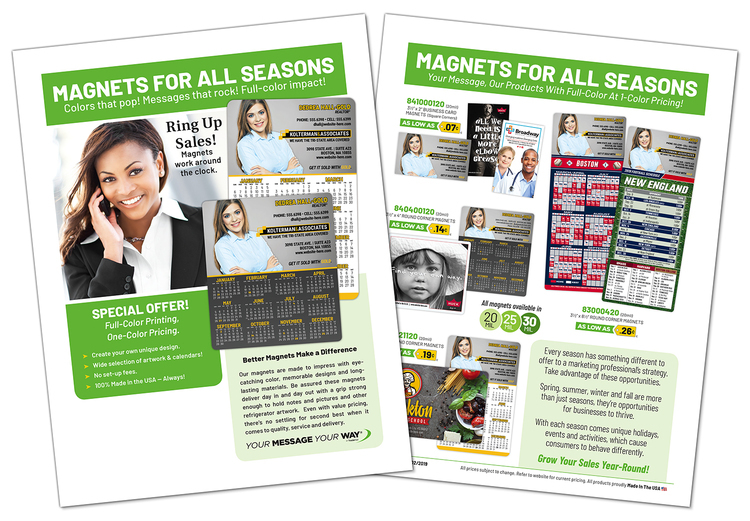 FREE TradeNet Calendar Magnets Marketing Flyers Informative marketing flyer from TradeNet featuring 3.5x4 and 4x7 Round Corner Magnets, pricing and options. This free full-color flyer makes a useful & informative hand out. Available space (3.625x1.8125) for you to personalize. 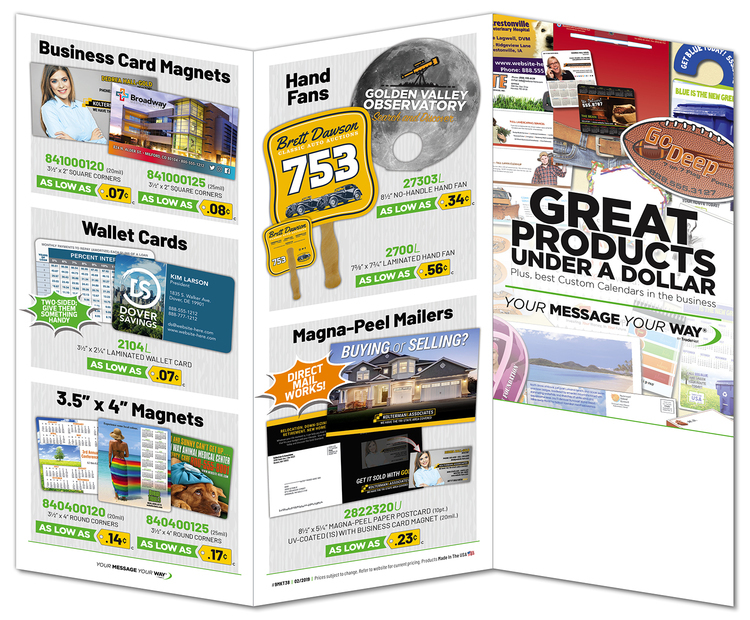 FREE TradeNet Great Promotions for Under a Dollar Marketing Folded Brochure Informative folded marketing pamphlet from TradeNet featuring promotional products priced under a dollar. 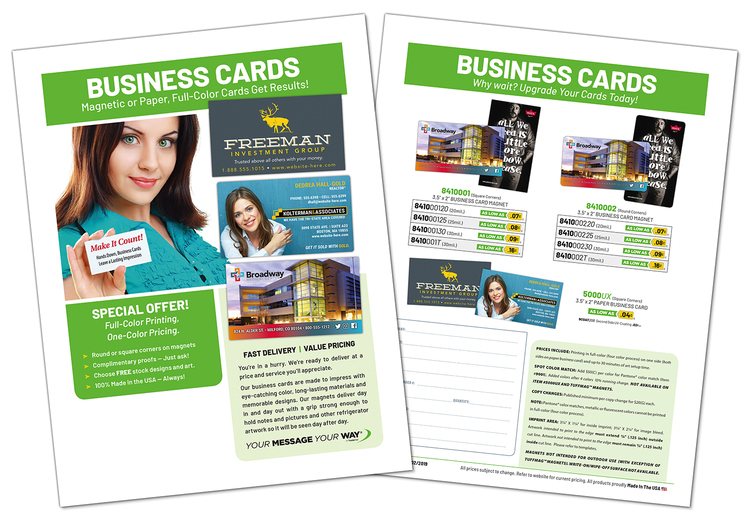 This free full-color brochure makes a useful and informative statement stuffer or hand-out. Available space (approx. 3.125x1.1875) for you to personalize. FREE TradeNet Business Card Magnet Marketing Flyers Informative marketing flyer from TradeNet featuring business card magnet prices and background options. This free full-color flyer makes a useful & informative hand out. 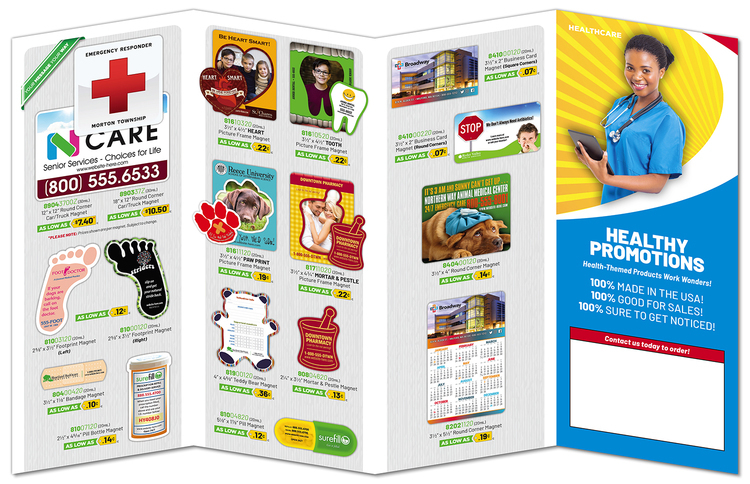 FREE TradeNet Healthy Promotions Marketing Folded Brochure Informative folded marketing pamphlet from TradeNet featuring products designed exclusively for the health industry. This free full-color brochure makes a useful and informative statement stuffer or hand-out.